charges against former WRD attorney John Harris. Harris is suing the WRD to keep the document confidential. An exclusive expose and public records request by Hews Media Group-Community News related to a settlement agreement between Los Angeles based attorney John W. Harris of Harris and Associates and the Water Replenishment District (WRD) has prompted a pitched legal battle between HMG-CN, Harris and the WRD, with Harris’ attempting to deny the Cerritos-based newspaper its lawful right, under the Freedom of Information Act, to view the settlement document. The agreement was negotiated after an ex-employee of Harris produced documents that proved Harris fraudulently overbilled the WRD in 2014. HMG-CN exclusively published that story Jan. 14 of this year. Further, an additional public records request has revealed that WRD placed clauses in the Harris settlement agreement that directly violate relevant Government Codes concerning the California Public Records Act, (CPRA). The original Jan. 18 HMG-CN request asked for the settlement agreement between Harris and the WRD. The negotiation for the settlement agreement was between Harris, WRD President Sergio Calderon, and Directors Rob Katherman and Albert “Lil Al” Robles. A subsequent letter received Jan. 29 from WRD attorney Francisco Leal of Leal-Trejo (Leal) indicated there were “documents responsive to HMG-CN’s request” and asked for more time to comply. Eleven days later, in a letter dated Feb. 11, Leal denied the entire request. HMG-CN found out that word of the request was communicated illegally to Harris. Leal said, “We have received correspondence from San Diego based attorney Nancee Schwartz representing Harris. Ms. Schwartz is best known for running a “drug smuggler’s diversion program” in San Diego. The threatening letter from Schwartz was received by Leal on Jan. 26, eight days after HMG-CN sent in the original request to WRD. San Diego based attorney Nancee Schwartz’ letter to Leal-Trejo. Soon after HMG-CN received the refusal to the request, Aviles sued WRD on Feb. 16, serving the district with a “Summons and Verified Petition for Writ of Mandate for Violations of the California Public Records Act,” (Writ) to compel the WRD to produce the documents. Writ of Mandate filed by HMG-CN, click on image to view entire document. The Writ slammed the WRD for violating several Government Codes, in addition to the Codes violated in the settlement agreement, pertaining to the CPRA and for withholding the documents. After writing a detailed letter outlining Harris’ objections to the disclosure of the settlement agreement, Schwartz then passed Harris’ defense to the Los Angeles based law firm of Ivie, McNeil, and Wyatt (Wyatt). Wyatt promptly filed a Writ stating that the Harris settlement agreement is not public record due to the confidentiality clause contained in the document. Harris’ Writ filed against the WRD arguing the settlement agreement is not public record. Click on image to see entire document. Calls into Harris and Schwartz went unreturned. The legal battle stems from an article published in May 2015 by HMG-CN that exclusively reported the WRD paid nearly $10 million in legal fees since 2012. One of the biggest recipients, Harris & Associates and its principal owner, John W. Harris (Harris), billed the water agency over $2 million in less than 28 months. HMG-CN obtained billing documents that showed during one timespan from 2013-14, Harris billed $1.177 million, averaging over $98,000 per month. HMG-CN obtained over 700 redacted pages of Harris’ invoices showing Harris monthly billings to WRD. From Feb. 2013 to Jan 2014, Harris billed over $1.177 million averaging over $98,000 per month. Inside sources told HMG-CN that Harris was “cut off” in late April 2014, subsequently engaged in dispute negotiations, and came under an “independent investigation” related to the massive legal fees. Many in the water industry knew about the investigation at the time. The dispute negotiations with Harris started in late 2014 when the WRD Board, led by President Sergio Calderon, Director Rob Katherman, and Director Albert “Lil Al” Robles, hired Los Angeles based Sheppard, Mullin, Richter & Hampton (Sheppard) as “independent counsel” to investigate the alleged overfilling by Harris. No one at WRD questioned the fact that Sheppard was also involved with WRD on other water-related legal matters and that a true independent counsel was not hired. But the apparent conflict of interest, even though questionable, would not be a factor in the investigation. 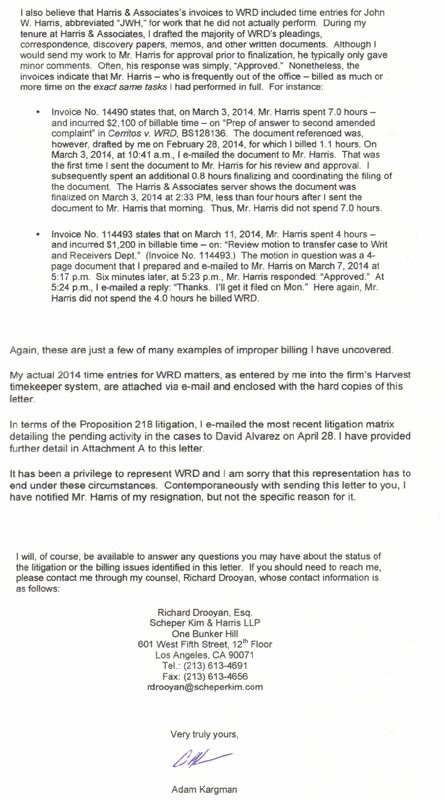 HMG-CN then exclusively obtained a document submitted by attorney Adam Kargman in April 2014 from a former WRD Board member outlining the Harris overbilling in great detail. Most of the overbilling was related to the Cerritos v. WRD lawsuit, L.A. Superior Court case number BS128136. The document was addressed to WRD Directors, General Manager Robb Whitaker, and WRD Chief Financial Officer Scot Ota. Based on his review of time attributed solely to his work in January 2014, Kargman identified at least 51 fabricated entries and approximately 51.9 hours of padded time. 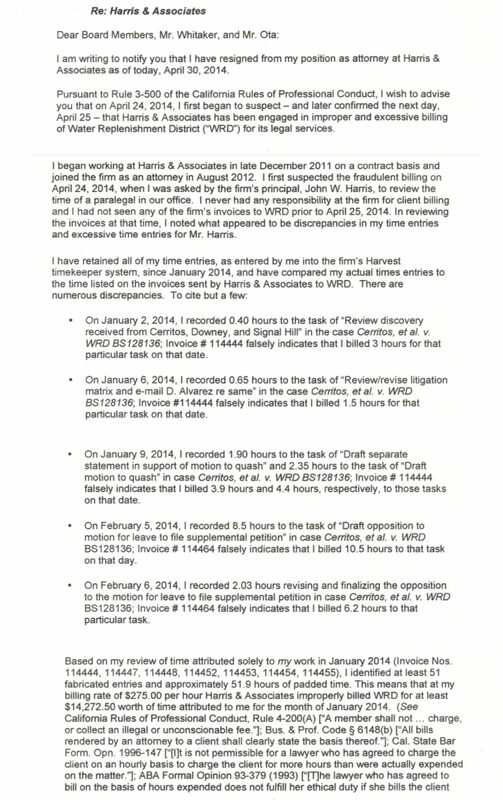 Kargman then indicated that he also believed that invoices to WRD included time entries that Harris did not actually perform. At the time, Harris was paid $300 per hour. On one invoice, Harris claimed he spent seven hours reviewing a document sent to him by Kargman. Another invoice indicated Harris spent four hours reviewing a document sent to him by Kargman.